Most photography books show Colorado from a profile or side view, which often makes it difficult to envision the entire scene because of our high mountains. We literally cannot see the forest because of the trees. The photography of aerial photojournalist Jim Wark allows us to truly see the entire forest - complete with its rivers, roads and even wildlife paths. This unique viewpoint allows the reader a better view of the connectedness, patterns and interactions of the land and the people of Colorado. 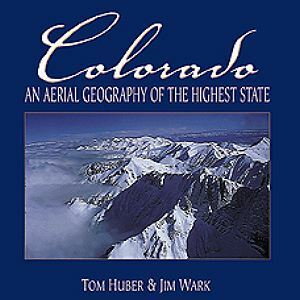 Geographers such as Tom Huber are used to seeing our beautiful land from this unique perspective, and his text will help lead us into a better understanding of the complex and rapidly interchanging landscape of Colorado, where intricate physical and human activity interweave and interact. Tom has used his unique skills as a geographer to help the reader go beyond the visual impact of these stunning landscapes to an understanding of many of the reasons that our awesome and majestic state looks the way it does.